I recently came across a blog that I have really started to enjoy: New Life on a Homestead (You can also find the button to their page under Blogs I Love). I have really liked this blog because it covers so many things I can relate to: Motherhood, Homeschooling, Frugal Living - and it has been one of my biggest inspirations for starting our own little family garden and living more simply. 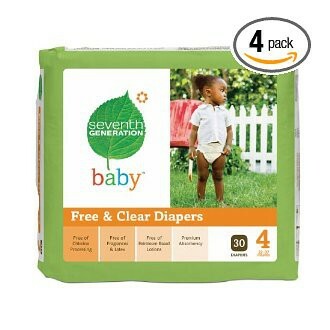 She is currently doing a Giveaway for the 7th Diaper Generation Diapers HERE! If you are a mommy who could use a few extra diapers (and who of us couldn't?!) - please go visit, enter the giveaway (it ends on Monday, Aug. 1st - so do it quickly!) and check out her blog - it is one I visit almost daily! I have not personally tried this brand yet, but have always wanted to when at the store. (When we do buy disposable we go for the cheapest - usually store brand.) But these diapers are made without chlorine, fragrances, latex or petroleum based lotions! One of the main reasons I switched to cloth in the first place was all the chemicals that were thrown into disposables. For any who choose to enter: good luck! If nothing else, take a look around her blog - some great stuff there! And wish us luck - Lord knows we could use all the diapers we can get!